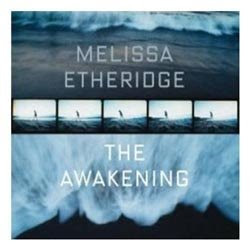 In the liner notes to her new album The Awakening Melissa Etheridge asks listeners to set aside an hour and play the CD straight through. This is sound advice. More than her previous albums the songs on this one flow together cohesively. She herself has called it a concept record. The subject matter is her life viewed through the prism of recovering from Cancer. While that might sound a bit maudlin the music is anything but. It swings and it rocks, most often simmering just below a rolling boil. If you’re already a fan this is a fine addition to the Etheridge catalog. If you’re new to her music “The Awakening” does a good job touching the various styles of music she has played over the years. Bluesy guitar, gritty vocals and heartfelt lyrics all delivered passionately are on display. Most importantly for an artist such as Melissa Etheridge many of the new songs seem well suited for her live show. And that’s perfectly appropriate as she’s a live performer before anything else.